Burnt toast isn't *that* delicious. You could always scrape off the burnt part. It's funny because we believe that the ends justify the means and torture is acceptable in certain situations. Jeez poor guy. 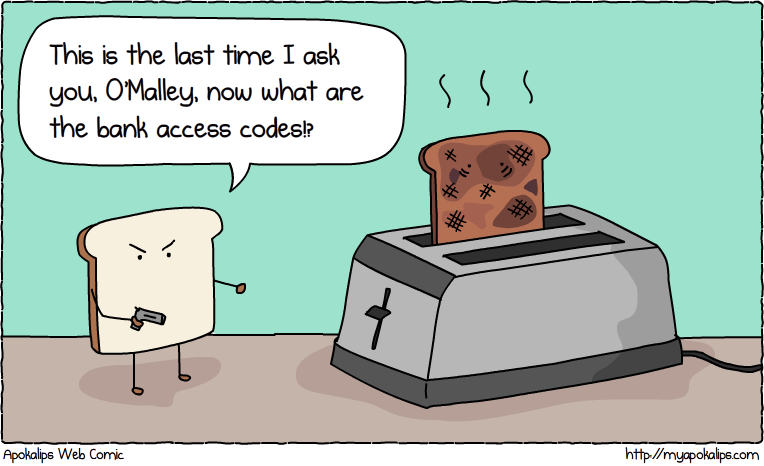 But what I'm wondering is how a piece of bread is going to rob a bank? Your toast is burned, and no amount of scraping will remove the blackness. Hahaha!! Pure genius love it!! Fantastic comic! And damn you just a little bit for making me laugh out REALLY loud at public places. I hold you responsible for all the weird looks I've been getting today. But I can't stop reading on! Could this comic be some sort of doctor's prescription?